The Olympic champion indeed showed that he is indeed capable of fatigue and committing mistakes. Nevertheless, he proved that he is still the best men's skater in this skating-obsessed nation that boasts a competitive field. As many expected, Shoma Uno was the closest to Hanyu, finishing second overall, followed by Takahito Mura, who improved from last year to receive the bronze medal. 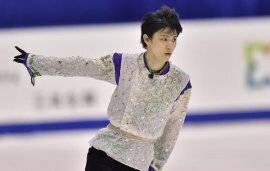 Hanyu, who was looking to win his fourth Japanese title in a row, started Friday's short program feeling "very relaxed." Perhaps he was a bit too relaxed, as he fell on his opening quad salchow. In spite of the fall, Hanyu immediately got up and proceeded with his planned spread eagle exit and delivered the rest of the program with supreme quality, like he had in previous competitions, including a quad toe-triple toe combination that was rewarded with a Grade of Execution (GOE) of +3 across the board. As the only skater to perform two quads in the short program, his advantage in base value was unmatchable - even with a fall - with all of his other elements executed beautifully. The world-record holder was came away with 102.63 points and headed into free in first place. 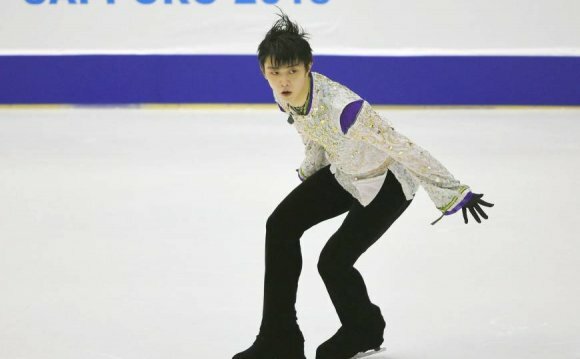 Shoma Uno, the silver medalist from this event last year and the 2015 Grand Prix Final bronze medalist, pulled out a mostly clean performance, with the exception of a weak landing on a quad toe. He received 97.94 points for second place in the segment. Mura gave his best performance of the season and was rewarded 93.26 points, comfortably landing in third place. Daisuke Murakami placed fourth with 83.49 points, while 2011 world silver medalist Takahiko Kozuka sat in fifth place with 78.19. Keiji Tanaka placed sixth in the short with 74.19 points.